Your business vehicles are on the road all day – service and installation calls, business meetings, deliveries. Why not have those vehicles do double duty? Vehicle “wraps,” which display you ad messages on the sides of trucks, vans and even personal automobiles, allow your business to use high-visibility and highly mobile vehicles as a way to reach new prospects and customers effectively and economically. We’re all used to seeing cars and trucks – not just on the road, but in magazine and newspaper advertising and on TV commercials – with their plain-wrap “native”paint jobs. 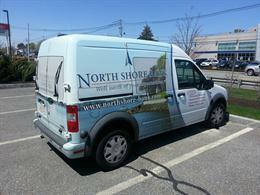 So it’s no surprise when any vehicle wrapped with vivid graphics and text advertising stands out and gets attention. At Metro, we consider ourselves lucky to work on a wide variety of different projects. 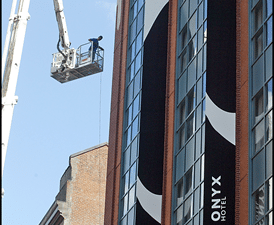 We take pride in selecting the right materials to craft the signs our clients want, need, and have envisioned. 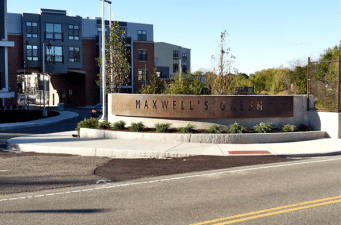 Whether the client is a design/build firm, a general contractor, or an individual business owner, whether it’s interior or exterior signage, whether the job site is around the corner or three states away, we truly enjoy the variety we have in our work. You’ve seen vehicle wraps on the street, in your parking lot, and all over. They’re hot, and they’re busy, appearing everywhere, generating new business as they go. But what do you know about vehicle wraps? We cornered one to see what it could tell us. 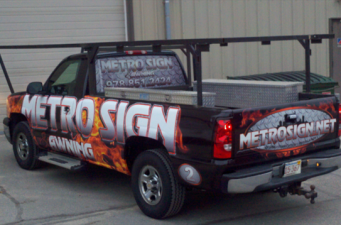 Metro Sign & Awning: So, what do you do all day?